Joe Waters was part of the Republic of Ireland side that faced Northern Ireland at Windsor Park at the height of The Troubles in 1979. The teams played out a scoreless draw at Lansdowne Road in September 1978. HE’S BEEN IN the United States for a very long time but Joe Waters certainly hasn’t lost his Limerick lilt. It’s been over 30 years since he swapped Grimsby Town for the Tacoma Stars of the Major Indoor Soccer League and settled in the picturesque Pacific northwest. By that stage, he’d already made his final appearance for the Republic of Ireland: a traumatic trip to Windsor Park in 1979. 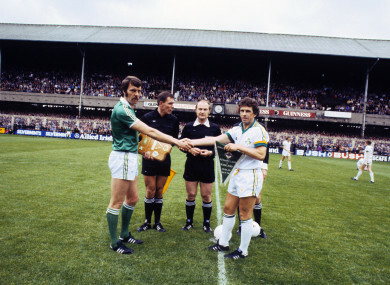 Ahead of the European Championships in 1980, John Giles’ side were drawn in a competitive and highly-charged qualification group alongside England and, for the first time, Northern Ireland. The presence of Denmark and familiar foes Bulgaria made the chances of reaching the tournament all the more unlikely. The Irish began with three successive draws: a solid away point in Copenhagen, a missed opportunity against the North at Lansdowne Road and a 1-1 result at home to England. With only one team progressing and Ron Greenwood’s side particularly goal-happy, qualification seemed out of reach for the Irish even by the half-way point. By the time they made the journey to Belfast in November, there was nothing left to play for except bragging rights. The North had suffered a thumping 5-1 home defeat to England the previous month but were intent on finishing strongly. A victory over Giles’ team would move them into second place in the group and mean Ireland would need a win at Wembley in their final fixture to conclude the campaign as runners-up. Waters, who had been signed by Leicester as a teenager before properly blossoming at Grimsby, had made a memorable debut in a friendly against Turkey in Ankara in 1976, coming on and scoring the equaliser in a 3-3 draw. He’d been a part of various Irish squads but always seemed on the periphery. Finally, three years after his first competitive appearance, he picked up an unexpected second cap. “We had a terrific group of players at the time,” he says. It was the height of The Troubles and it had been another harrowing year. In August, two IRA bombs killed 18 British soldiers at Warrenpoint in Co. Down. The same day, Lord Mountbatten – Queen Elizabeth’s cousin – and three others were killed by an IRA bomb in Sligo. The tension wasn’t helped by the election of Conservative leader Margaret Thatcher as British Prime Minister. Waters admits that even entering Belfast was an experience. “Once I got there, it was intimidating in itself,” he says. Waters is quick to point out that the atmosphere certainly wasn’t unexpected and that the players had experienced plenty of hostility before. But, for various reasons, Windsor Park was still unsettling. “It was definitely a tough time but there were worse things going on up there and you were aware of that too,” he says. “But we’d been in pretty intimidating places before. On my first trip to South America, we were in Montevideo in Uruguay and heading to training in the morning and there were guys trying to overturn our bus on the way to the stadium. In Turkey, we were battered with glass bottles after we equalised. In Chile there was still a curfew in place. It wasn’t like we hadn’t seen stuff like it before but it didn’t make it any less intimidating. But it’s amazing how guys can put that to the side. Once the game gets going, you can’t hear anything because you’re too involved in it. Sometimes I joke with people who ask me what it was like at Windsor Park. I tell them it was the quickest warm-up any team ever went through because none of us stopped moving. Ultimately, thanks to Gerry Armstrong’s header early in the second-half, it was the hosts who claimed a famous victory. The following February, a brace from Kevin Keegan condemned Giles’ team to a 2-0 Wembley defeat and the entire Euro campaign ended with a whimper. Giles himself was gone shortly after and history hasn’t been kind to that pre-Charlton period of Irish football. But Waters feels the players involved during that era are largely under-appreciated and that despite failing to reach a major tournament there was plenty of quality. A clipping from GOAL magazine's feature on a young Joe Waters, then of Leicester City. “When you look at the likes of John, Liam Brady, Mick Martin, Steve Heighway – they are some of the best players that ever played for Ireland in the modern era,” he says. Waters, who’s still coaching at underage level in Tacoma having carved out a legendary playing career in the city, had a front-row seat to the talent within the Irish setup at the time. And he’s still thankful for that opportunity. “I get a little bit irritated sometimes when they talk about the golden era and how it came about with Jack,” he says. “We were just a step away each time and the day we beat Russia in Dublin when Don Givens scored a hat-trick and Liam made his debut and Steve was absolutely brilliant on the wing, that was one of the best performances I’ve ever seen from an Irish team and I’ve watched a lot of internationals since then. To be a part of that in Dalymount was absolutely unbelievable. I don’t think that team gets the credit it deserves and I don’t know why, I really don’t. Email “'I remember coming out for the warm-up and the chants were 'Kill the Fenian bastards''”. Feedback on “'I remember coming out for the warm-up and the chants were 'Kill the Fenian bastards''”.